It took 7 whole days after school started for the germs to get to me. 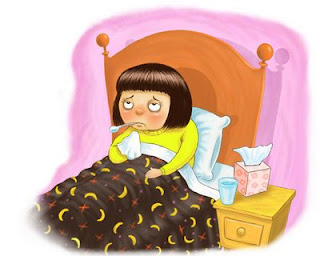 Everyone is worried about the swine flu, but I have been overcome with a common head cold. Usually I would tough it out and go to work anyway, but showing up sniffling and red nosed would probably not go over so well right now. So here I sit with my tissues and orange juice, doing very little of anything at all. The first week of school was good. My kids are settling in nicely and are happy with their teachers. My classes are good. The new prep is taking a lot of time, but I like the material and the students. Juggling the three classes is fun, and I'm never bored. On the quilting front, I finished up the first border on Mom's Sister's Choice quilt. It needs to be ironed so I can get the last border measured up. I'm going to try quilting it in two sections. Although I've never done it that way, Amy does all her quilts that way and swears by it. I'm hoping I have some time to get it all layered up this weekend. The first day of school has come and gone. Brand new outfits. Freshly sharpened pencils. Backpacks stuffed to overflowing. So many mixed emotions flowing through us all. Funny story. The kids are in aftercare this year for the first time. I worry about them because that is what moms do. I thought I would let them go and get signed in yesterday, but not make them stay too long. So I rushed through my own work and dashed to the school to pick them up as soon as possible. They didn't want to go home. Sydney stomped her foot and demanded to stay longer because she hadn't had enough time to play with her friends. I couldn't drag her out the door until after I promised to pick her up later today. My own students return tomorrow. I think everything is ready and waiting for them. I guess I'll find out soon enough. I haven't spent much time lately looking and commenting on everyone's blog. I'm sure I will have time to catch up again when everything settles into a normal routine. I hope you are all well and still enjoying your own vacations. I had promised the kids I would take them to see Aliens in the Attic this morning. Last week I took them to G-Force on the spur of the minute and as soon as we got home, Anna's friend Sierra called to see if she wanted to see it (again). Because Ryan had gone the night before with two of his friends, that meant that two of my children saw the same movie twice in a very short period of time. So this time, I planned ahead and asked Sierra if she wanted to join us. Her mom is my friend Meisje, who also volunteered to come along so I would have grown-up company. At that point I started to feel bad that we were both going to have to sit through the same silly kids movie. That is when the plan started to form. Instead of sitting with the kids through two hours of Aliens, we would settle them into their movie and then go see Julie and Julia, which just happened to start five minutes later. What a brilliant plan! 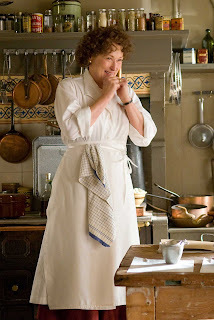 Julie and Julia was absolutely delightful. I would highly recommend it, especially to anyone that has a blog. In case you haven't seen the previews, it is the story of a woman who decides to work her way through every recipe in Julia Child's Mastering the Art of French Cooking during the course of a year while blogging about her progress. It is, of course, about more than just cooking. After the movie we went out to Jason's Deli for lunch and then popped into the book store on the way home. It was an excellent way to say goodbye to summer. The kids hop on the school bus bright and early in the morning for a brand new school year. Crisp new backpacks, freshly sharpened number two pencils, gleaming white notebook paper, empty folders awaiting possibilities. What could be better than a brand new start? I truly think that one of the best things about teaching is the ability to start new and fresh every single year. How many jobs offer that? 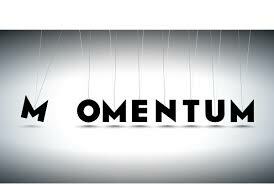 I'm off to school for the day to try to get a head start on my own work before official meetings commence tomorrow. I'd like to print out a syllabus, year long plan, student learning plan and unit 1 lesson plan for each of my three preps. I also want to print out the same for the classes the new teacher is taking on. If the copiers are open, I'll also copy the day 1 handouts. I couldn't rush off without trying to get a final picture of the green and purple star quilt after finishing the binding last night. It is going to be called Twilight based on a suggestion by Quilt Pixie who thought it looked like a sunrise. The kids called last night to let me know how their visit with the grandparents is going. Sydney said they were coming home from a baseball game between a gray team and a green team but nobody got any points. They ate ice cream though, so it was a lot of fun. They are both having a lot of fun with Sunny who is Nana's new labradoodle. I have a feeling that I am getting closer and closer to losing the puppy battle. Kurt was on line last week looking up shelter and rescue pugs. Maybe I can convince everyone that next summer would be a good time. Big sigh, I was looking for a new hobby and feeling like I don't clean up after enough mess makers, right? Just finished the quilting on the blue and purple star quilt. Quilt Pixie suggested Sunrise as a name for the purple of the sky and the green for trees. To me it looks more nightimey. So how about Twilight? I'll sleep on it. I'm trying hard not to stay up until all hours, so I'll put on the binding in the morning. I did a basic meaner in the middle and put feathers in the borders. The thread matches exactly, so they don't show up at all. Probably best, a chance to practice on a real quilt and not see all the mistakes. Anyway, I used washable marker to sketch the general shape, so I'll have to throw this one in the wash as soon as the binding is done. Quilt Penguin has posted the UFO for August, it is number one, so for me that is my Elm Creek Quilt. 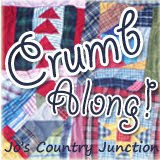 It is just in need of hand quilting, so that is a good project for August which will be busy with back to school. It is amazing how much can be accomplished with absolutely no interruptions. I kept peering over my shoulder all day, expecting somebody to need something, but it was just me and a sewing machine all day long. I got the borders put on the purple and green star quilt, pieced a backing, layered, basted, and am now about half done with quilting. I'm taking a dinner break and then I think I'll go finish it up. Tomorrow there are errands that need done, so I'll see what I can finish up today. My entire family has abandoned me for the week and flown to North Carolina to visit family. It is strangely quiet in my house right now and I think I am enjoying it. Kurt usually has to take vacation time to stay with the kids during preplanning so this year he decided to actually go on a vacation. I'll be back at school next week getting ready for classes to start. I went in to school this morning for a couple of hours and again this afternoon. In between I made 5 more blocks to add to the purple and green star quilt and put it all together. It doesn't look so bad from a distance, but when you get up close and personal it show off truly shoddy workmanship. Still, finished is better than perfect, and I have learned oodles since I started this quilt 7 years ago. Now that I look at the picture I am bothered by the asymmetry, but I'm trying not to think about it. I'm going to add a wide blue border and get it all layered up likety split. Then I'll go see what the August UFO is and move on with my life. 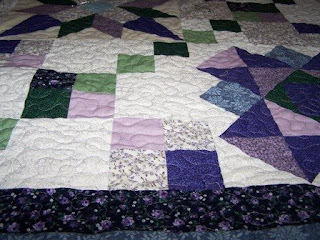 Does anybody have a better suggestion for a name than purple and green star quilt?